VirSyn has released version 2.0 of its reverb plug-in, Reflect. Version 2.0 of Reflect comes with a new RealIR Engine using direct convolution of the critical early reflections without compromising the flexibility of the algorithmic reverb tail generation. The resulting density and smoothness rivals those of the most expensive hardware reverbs. • RealIR combines convolution of early reflections with algorithmic tail generation. New customers can purchase Reflect for €169 (without the dongle). 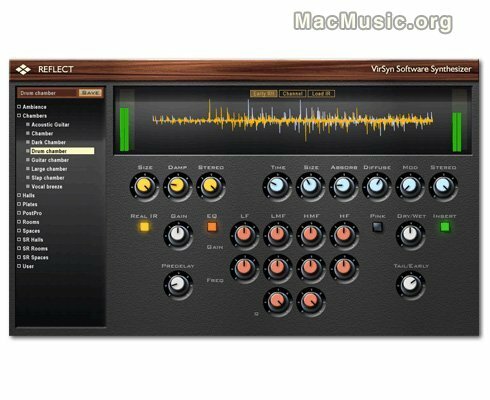 It is available for Windows and Mac OS X in VST, VST3, AU and RTAS plug-in formats. The upgrade is free of charge for Reflect owners. A fully functional/time limited demo version is available (a Syncrosoft USB-eLicenser / Dongle is required).